Freedom Chair riders aren't just our customers - they're part of the GRIT family. Today's Rider Spotlight features Al Baker! Read on to learn about his adventures. "The biggest thing is being able to go off road. To just get off the pavement and go somewhere . . . For me, everything is a new challenge. Are you gonna get good at it, or are you gonna give up? I’m gonna get good at it!" Al worked as a sailing instructor with the Red Cross for 10 years. He has a particular affinity for water activities, but he enjoys just getting outside in general. About 2 years ago, Al went into surgery to have his left leg amputated due to long term diabetes. Two and a half weeks after losing his left leg, he went in for a minor procedure on his right leg. Unexpectedly, during the procedure they discovered he had necrotizing fasciitis. To save his life, they amputated immediately. "It was a huge change in what my expectations were as far as what life was going to be." A little over a year later, Al experienced sudden and unexplained bilateral Facial Paralysis. He lost the ability to make facial expressions and even speak for a time. He taught himself how to speak again in order to give the euology at a friend's funeral. Although Al has been dealt a challenging hand, he remains positive. He says his secret is in CHOOSING to do so. "If you practice being moody all the time, you’ll be good at it. If you practice being upbeat, that's what you'll be good at." Why did Al decide on the Freedom Chair? Al had been hoping to get back into camping and kayaking but was having difficulty with his standard mobility equipment. "Manual wheelchairs could pitch you right out so I started looking. I found GRIT, and I loved the story. I love getting off the pavement and going on the dirt. I would rather use my arms and shoulders rather than using something electrical." What is Al's favorite thing about the GRIT Freedom Chair? 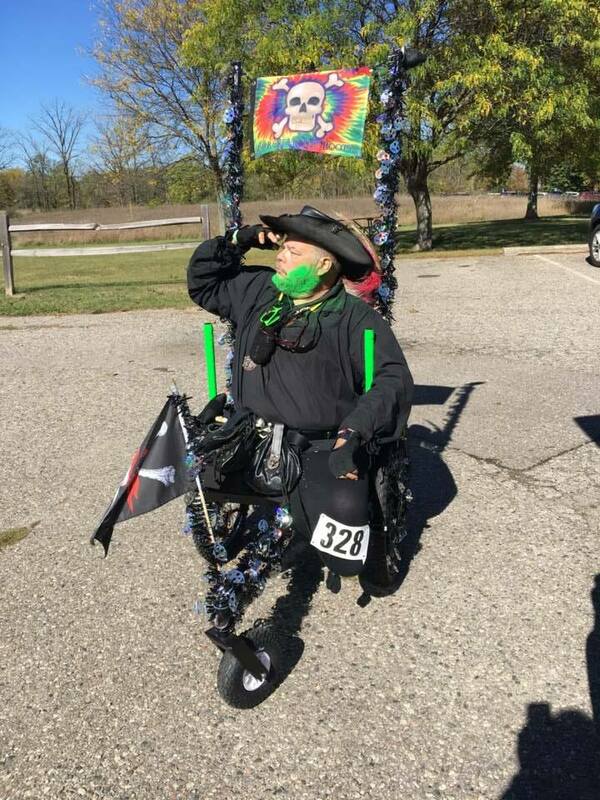 Al has participated in a couple of 5Ks since getting his Freedom Chair. He certainly draws a lot of positive attention and doesn't mind talking about the chair that everyone finds so intriguing. However, his favorite thing is just being able to go off the pavement with ease while spending time with his wife. "The biggest thing, honestly, is being able to go off road. To just get off the pavement and go somewhere. Even if it’s a hill I can’t do. I got a partner right here who doesn’t mind picking up the slack while I work, and we can both do something together . . . It’s the difference. It gives you the ability to do that. Want to share your own Freedom journey with others? Email community@gogrit.us to get started! It's a GRIT Life: Chapter 13 - "A GRIT Way to Camp"